All cricket on the computer is crap. Most are worse than crap. The best, occasionally give some semblance to a real game, before screwing you with a riot inducing lbw or ridiculous close in catch. Those few have been known to have fun batting controls, but none of them have ever had anything remotely resembling the nature of batting. And most make you wonder if the programmer really put soem thought into the interface design before cobbling together the graphics and other incidental add-ons. The bowling controls are always an order of magnitude worse than the batting ones. Mostly, it is inspired by what might have been. Games are a good rest break from perpetual reading, and flash games are suitable short to suit that break. 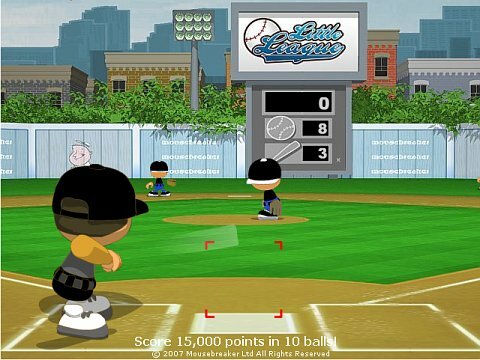 Pinch Hitter 2 is good for that, resolving the slightly bizarre scoring discrepancies and pointlessness of Pinch Hitter 1, and hitting that nice balance between gaining successful control of your destiny and its enemies: difficulty and luck. It also has a nice, simple interface, you click the mouse when the ball goes past. Subtly changing the position and timing allows you to direct the ball into different zones, and over different distances. Not easy, but possible. A sure-fire recipe for a successful game. So, if mousebreaker can make a pretty decent baseball game, then surely they can make a decent cricket game based on the same principles? Not remotely. As with most cricket games, they make two fundamental mistakes. The first is to assume that batsmen hit a cricket ball, instead of stroking it. Thus, the game involves precise timing, to anticipate the moment the ball passes the batsman, and to hit it. If cricket were actually played like that, then everyone would bat like Brendan McCullum or Vivender Sehwag: swinging at every ball and trying to belt it to or over the fence. And indeed, in every cricket game I've played, that tactic is invariably the best employed, because, in a game based purely on timing, timing it over the fence is at least as good a strategy as timing it along the ground. The second is to assume that because batsmen play different strokes, they need different controls. Thus, we have the ubiquitous three-key control: one for pulls, one for straight drives, one for cuts. No mention of the subtler (and for me, most prolific strokes): the leg glance, the glide, the square drive, or the tuck into the leg side - not to mention the hoik! Some developers have worked around this by using the foot placement as a proxy for direction, which works to a degree, but in doing so they lose the ability to distinguish between say, a well timed square drive, and a missed straight drive. Batting is not just about choosing a stroke and hitting the ball. Under these systems a player has no control of the shot, being no more than a baseballer with three swings. There need to be greater subtleties of foot movement, back, forward or across, of stroke-play, and of the wrist that allows both placement and creativity of stroke. Foot movement is too often simplified into a strange hovering shuffle around the crease. It needs to be considered as either a back foot, or a front foot shot, rising, or getting over the delivery, and made sharper, to allow the batsman to get further across, or out to a ball, instead of the perennial no-mans land you often find yourself in, should you be trying to play somewhat sensibly. Stroke play needs to be recognised as being predominantly about the line of the ball, to allow proper defensive and worked strokes to flourish. Most sensible cricket shots are low risk, because you can play them at any time, and then wait for the ball. It is only the bludgeon and the flourish that requires timing and skill, which is why, at many levels of cricket, you don't see the latter at all. Hence, my aim here is to note a better control mechanism, in the hope that one day I might have time to implement it, or if not, then someone else might perchance upon it. Firstly, the aim should be to reintroduce the bat as the mechanism of contact, by taking our lead from baseball. There, the bat is contrained by the pitchers box, but there are multiple possibilities. From outside off-stump a low shot would aim a square drive, a higher one a cut, or upper cut. From nearer the feet, a drive, or whip off the pads, and from higher, various pull, hook shots, or back foot drives. This is mouse contolled, aimed at a specific point past which the ball will travel, and from which (based on the timing and arc of the shot) will derive information on whether the ball was centered or edged. Secondly, foot movement, based on the keyboard will allow the player to go forward, back or across in line with the ball. Ending at the point where the shot begins to be played. Thirdly, the shot should be in two parts. On pressing and holding the mouse button, the arc of the shot and placement of the feet is set. This allows the player to get into position early, and play a defensive stroke down the line of the ball, without needing to time it, as such. Fourthly, while holding the button, changes in mouse position will direct the shot. Pulling back giving glides or glances, forwards a drive, and left or right to pierce the field. More aggressive mouse movement makes a harder shot. Finally, on release of the button, the shot should be played, giving a timing point. Holding the button down plays a block. Holding, then releasing on contact allows a glide or glance. Lofting the ball would involve hitting under the ball, using power, then timing to get it on the center (or if unsuccessful, straight up). Controlling the player properly would take practice, which should always be the aim, but the controls are also simple, involving just the mouse and keys until the player adjusts to timing and direction. But, fully enabled, any shot could be attempted and controlled. Rental crisis or distorted market? After the better part of half a decade of laments over the price of houses and the problem for first home buyers, the last year has seen a shift into concern over declining rental vacancy rates and a different kind of housing affordability. As a problem though, it is both better and worse then we think. Worse because the problem of insufficient housing stock and rising rentals - particularly where people are really concerned, in gentrified inner cities - is not going to go away quickly, and better because market distortions have meant there are substantially more people renting than perhaps there normally would. To understand why we need to go back to the late 1990s. Back then, a decline in interest rates, and a surge in investment actually brought vacancy rates up to around 4-5%. Obscenely high, and investors - particularly apartment investors - got burned. From that point onwards, we've seen declining vacancy rates, dropping slowly down to the 1% level being reported in the past few months. House prices also levelled off during this period, before surging again - for no reason I can discern - after 2004. But rents didn't increase with them. In fact, rents haven't even been increasing with wages, despite an apparent increase in the number of potential first home buyers (and therefore, reasonably well-off) people renting. Once again, negative gearing is partly to blame. "[...] we need to look back to the start of the housing boom in the mid 1990s. At that point, commonly used measures of gross yields on rental properties were in the order of 5-6 per cent. Over the subsequent decade, rents rose much less than dwelling prices, so that rental yields fell to relatively low levels � about 3 to 4 per cent (Chart 14). During this period, investment continued to flow into rental properties, as investors anticipated that capital gains would more than compensate for the low yield. "However, once it became clear that dwelling prices may no longer keep rising, the rental yield by itself was not sufficiently attractive to sustain the rate of investment, and the vacancy rate started to fall." How big a subsidy for renters? Well, if the reports of $2.4 billion in tax losses because of negative gearing are accurate then (at a tax rate of 40%) that translates into $3.6 billion in rental subsidies bfrom investors to lucky tenants. More, probably, but across the 3 million or so rental households that translates to an average of $1200 year, or $100 a month in rent. Which brings us to the two key problems we are now faced with. Firstly, as David Tiley's post on the topic points out, investors (90% of whom are mom and pop investors with only one property) can't afford these levels of subsidies under rising interest rates and rising inflation. Their hand is being forced, to either raise the rent, or sell up, and there is no incentive for new investment in the market. At the moment, we are seeing rapid rent rises in a tight market - a market that, after several years of stagnant prices and increased incomes, has a reasonable level of flexibility to do so. But it can't continue forever, and eventually, either rents will stop rising as the market opens up, or the owners will need to sell, with current renters making the switch to homebuyers (though what that might mean for prices is anyone's guess). The second problem is more troublesome while the market shakes itself out. At the bottom end of the market, where a thousand a year in rental subsidies makes a big difference, the rental market consists of poor families and young households (mostly students). The latter are a fluid group, preferring to rent, but often able to share houses, bedrooms or live wih their parents, when money is tight. The fact that the rental market has gone from flooded to dry in such a short period is not just to do with increased population in Melbourne. It has to do with the subsidies investors have happily worn in exchange for capital gains, and the concomitant increase in the number of rental households. As of the 2006 census, there were some 20,000 spare bedrooms sprinkled through Melbourne's group households, most of whom rent. There are as many as that again in lone person households, but it is hard to distinguish those between renters and the elderly. You don't hear about boarders as much anymore, it seemingly being something people did in the 1960s. With an ever ageing population, no shortage of needy renters, it might be time that idea was revived.